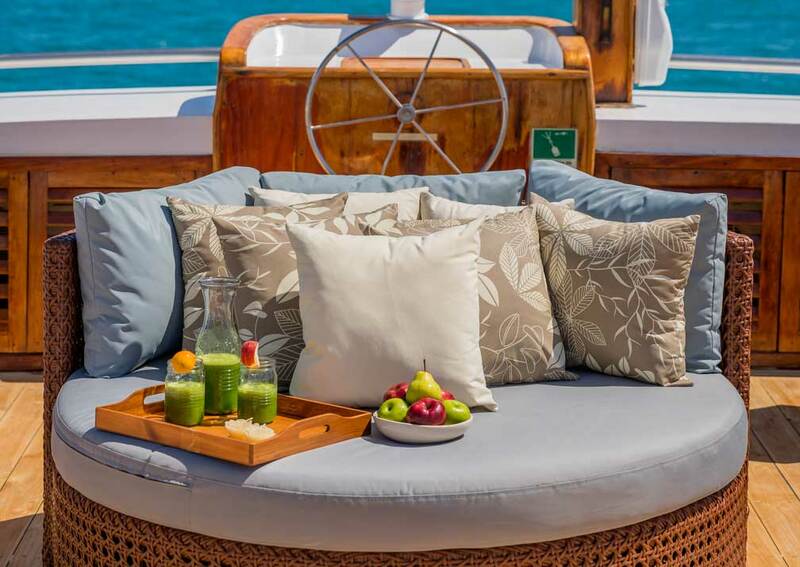 A luxury motor yachtwith with 9 roomy suites, 2 jacuzzis and a mini spa, and spacious indoor and outdoor social areas. 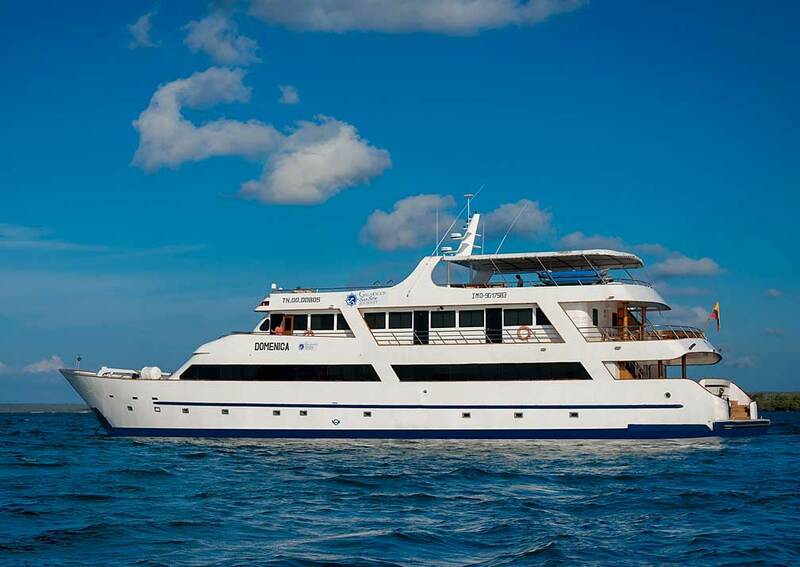 The Sea Star Journey (formerly called the Grand Odyssey) is a graceful motor yacht launched in 2011 offering top quality accommodation and amenities for up to 16 passengers. 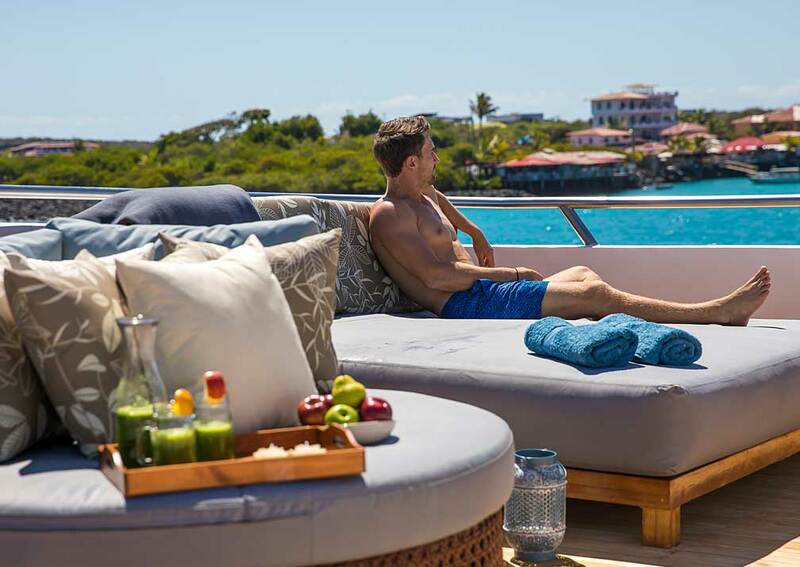 Enjoy gorgeous food and relax with a massage in the spa between island visits. 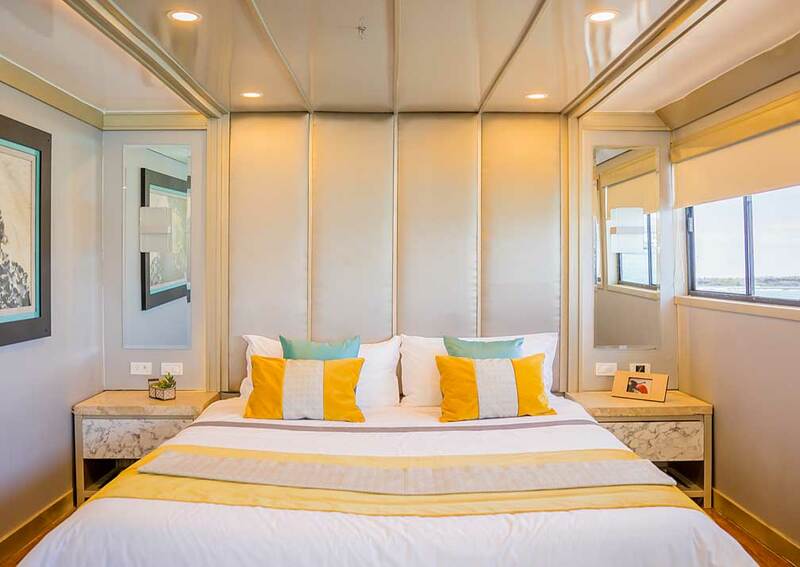 The 9 suites are well designed and have large windows so you’ll be able to enjoy the views from your own room. 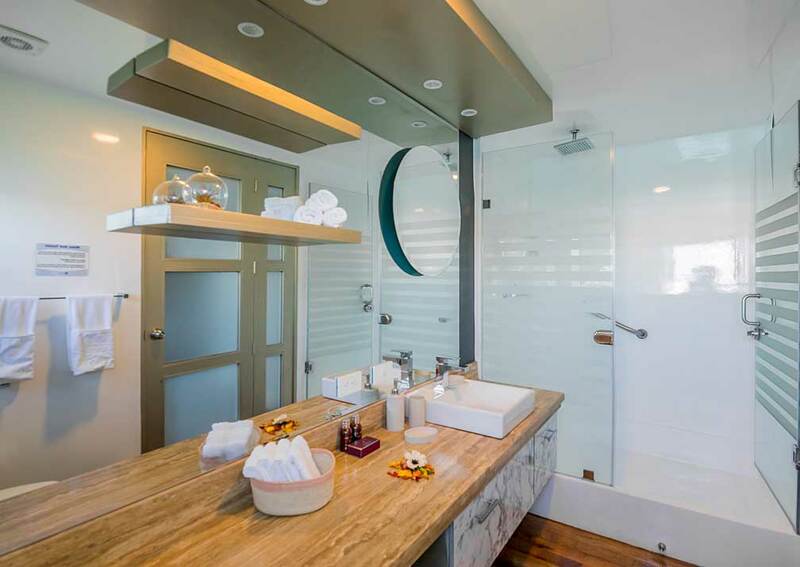 All come with private bathroom, minibar, TV and air conditioning. Interconnecting suites are ideal for families. 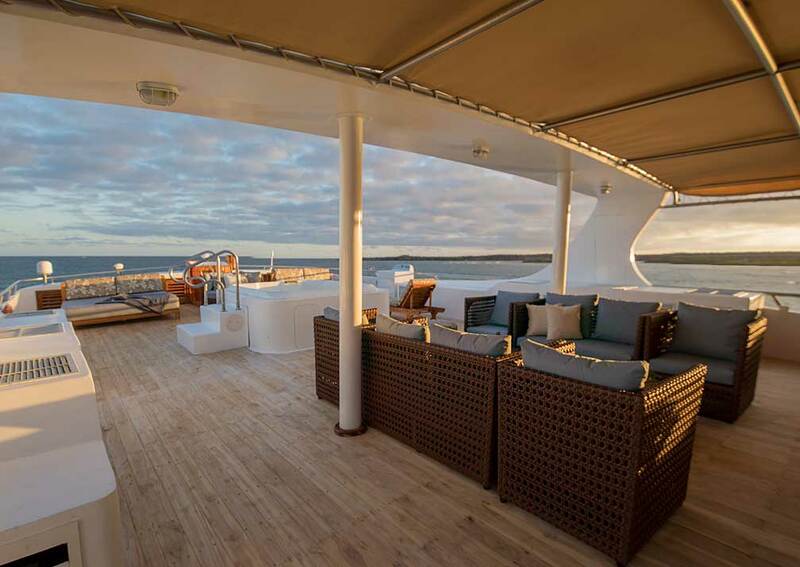 Relax on the large deck where you have the choice of sun or shade. There are 2 jacuzzis and a mini-spa to help you relax. Indoor areas include a lounge, library with books and DVDs, dining room and children’s play area. 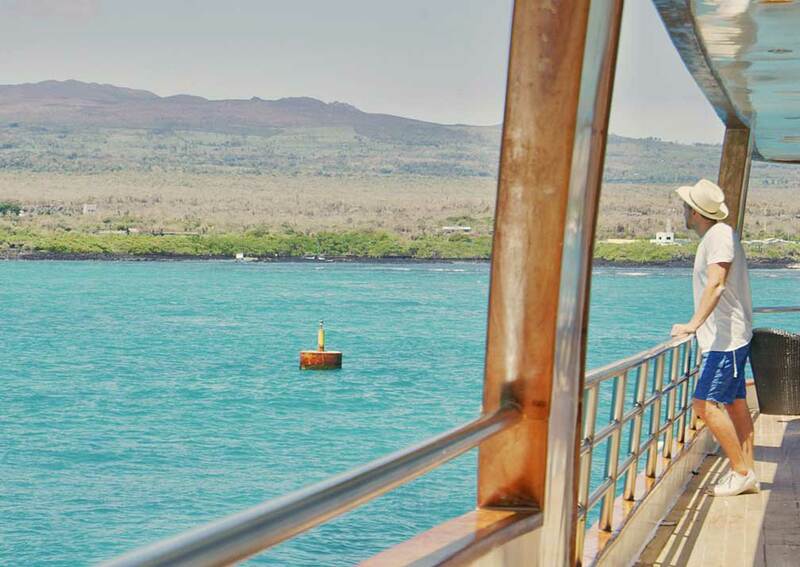 Sea Star Journey is equipped with kayaks and snorkelling equipment, free for passengers to use. The crew are good humoured and helpful. 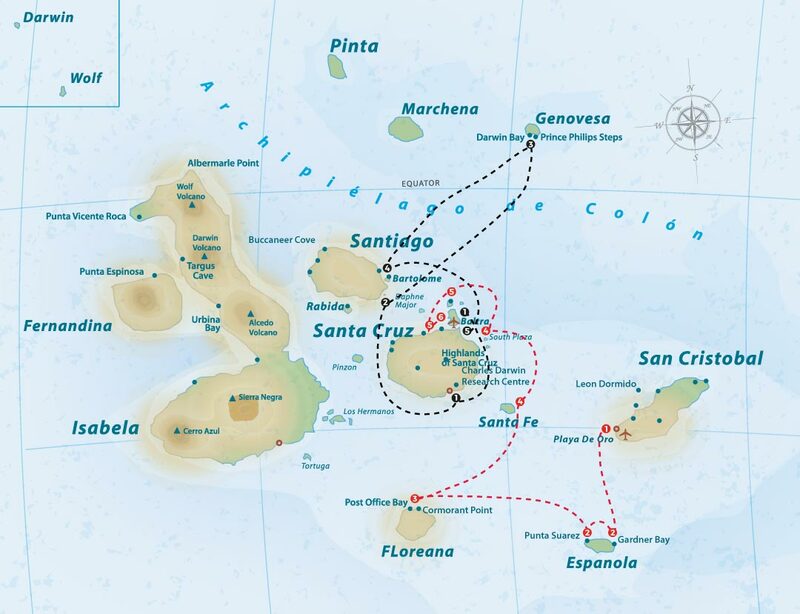 Sea Star Journey also offers 10, 11 and 15 day cruises. Please contact us for details. 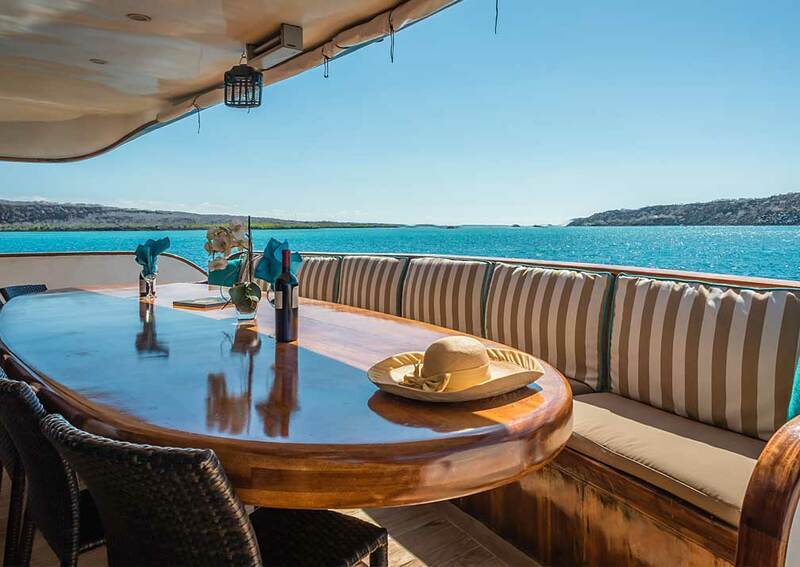 There are 7 Galapagos Suites, all 25 square metres, comprising 3 twin-bedded suites on the upper deck, 2 twin bedded and 2 double suites on the main deck. 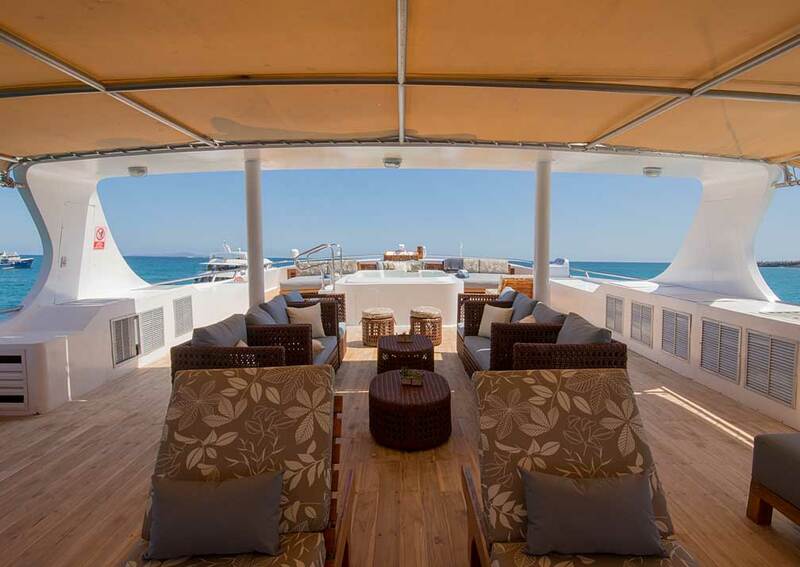 All have large windows, a seating area, minibar, TV, air conditioning and private shower room with hot and cold water. 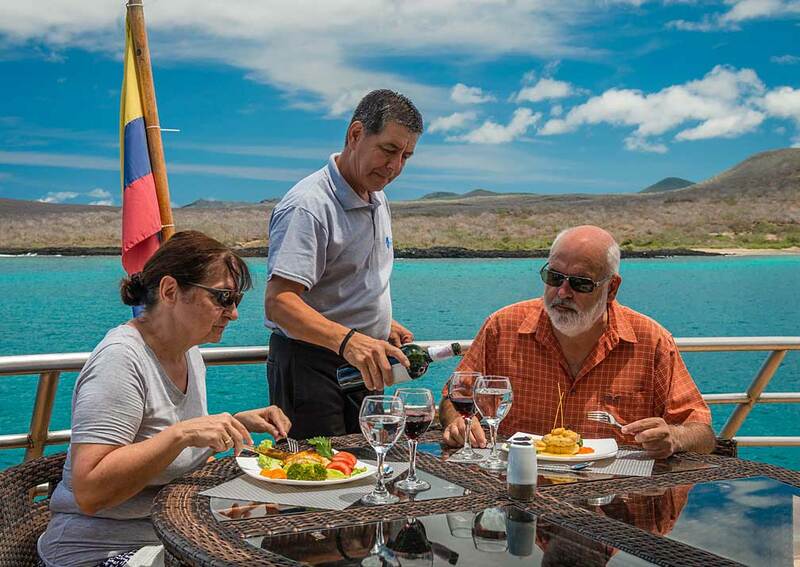 The 2 main deck Galapagos twin suites suites have private balconies. 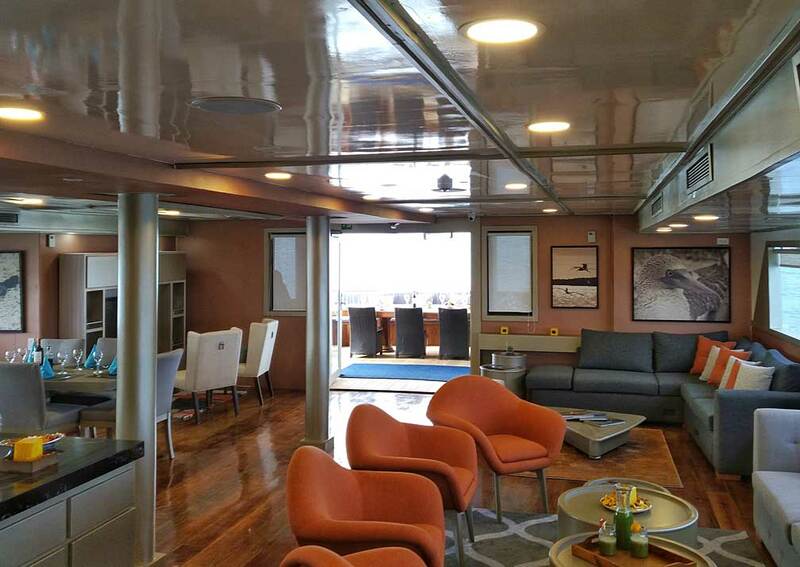 There are interconnecting suites on the upper deck. 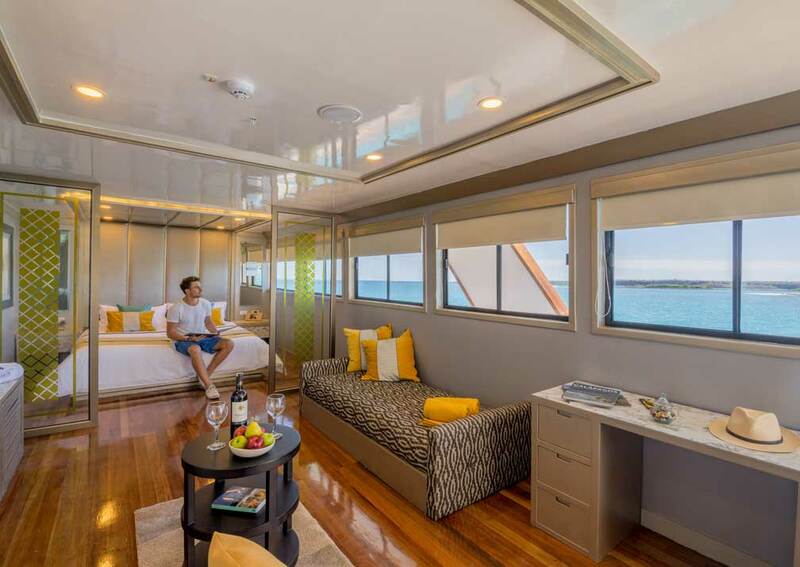 The Sea Star Suite, 35 square metres, is on the upper deck. 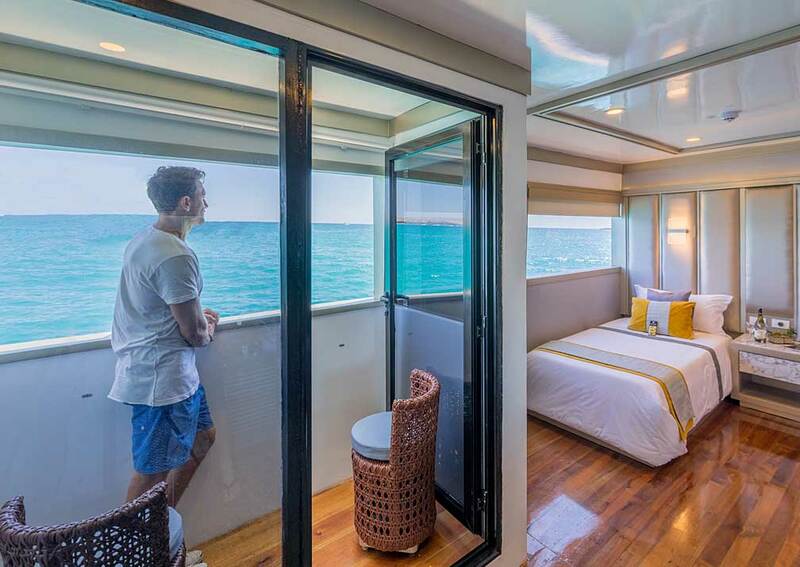 It is air conditioned, has a king size bed, living area with a sofa bed that can used for a child, windows, TV, minibar and shower room with hot and cold running water. 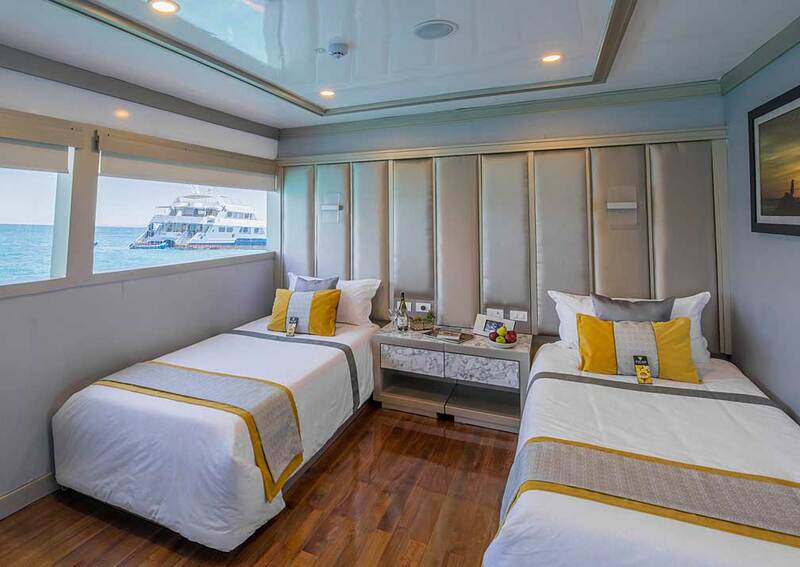 Accommodation: Main Deck: 2 cabins with double beds and 2 cabins with twin beds; Upper Deck: 1 cabin with double bed and 3 cabins with twin beds. 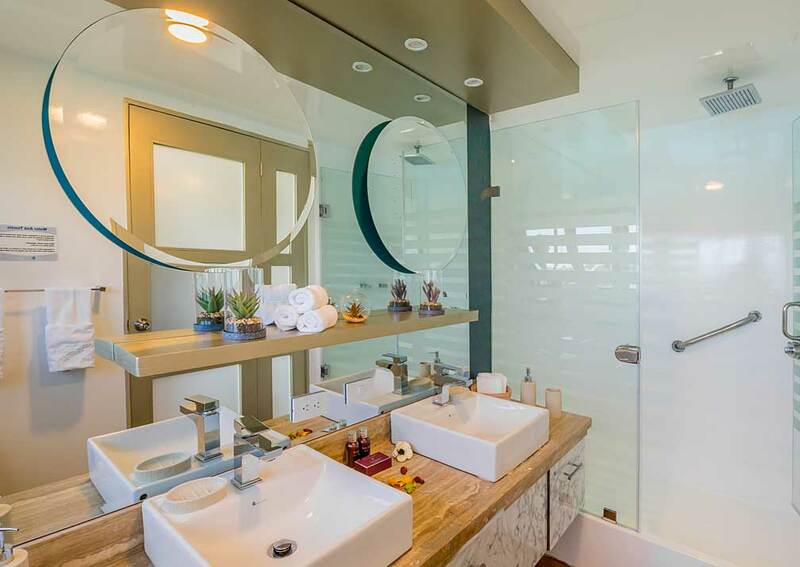 All have private bathrooms, air conditioning, TV, minibar and windows. 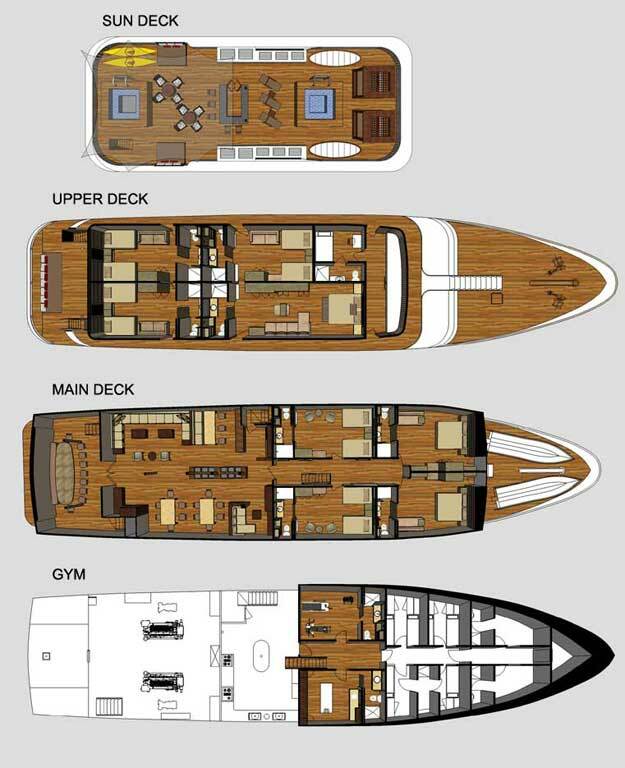 On Board: Dining room, bar and lounge, top deck with sunny and covered areas, dining space and 2 jacuzzis. She carries kayaks and snorkelling equipment.